Teeth whitening is always something I've wanted to have done. I don't have discoloured teeth, however I've always wanted them a little whiter. So, out of pure vanity, I set my whitening journey in motion and found myself at Knightsbridge Dental Care. Knightsbridge Dental Care is a dental practice that is located in the heart of Knightsbridge. It has a rich history, great reputation and an experienced and skilled team. The dental practice covers all aspects of general dentistry, from routine fillings to cosmetic dentistry and dental implants and it prides itself on a high quality, discreet and personalised dental service. Now, there are many types of whitening treatments available, from whitening toothpaste and whitening strips to custom-made whitening trays. Knightsbridge Dental Care offer the latter as it is considered the safest type of professional whitening out there. Before beginning the treatment, my teeth were examined to ensure they were healthy and suitable for whitening. The condition of my teeth also indicated the strength of treatment I could have. Molds were then taken of my teeth, which involved a large mouth guard full of blue putty being pressed against my top and bottom teeth (one set at a time) for a few seconds until the putty hardened. The completed molds were then used to create my custom-made whitening trays. I found the whitening really easy. 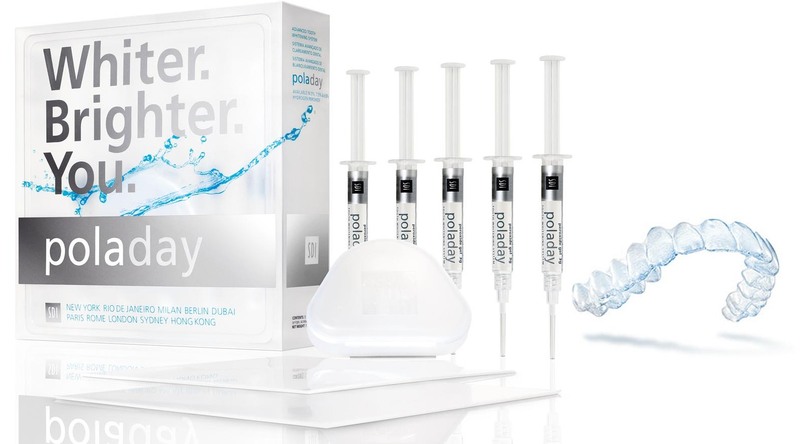 The PolaDay and PolaNight come in syringes, helping to distribute the whitening gel into the trays evenly and easily. You can choose to whiten as many teeth as you like, however I only chose to whiten those visible when I smile. Only a tiny amount of gel is required per tooth because, once the trays are inserted, the gel spreads out and covers the entire surface of the teeth. The trays themselves feel very comfortable when inserted - if it wasn't for the slight lisp they give me when I talk, I would barley notice they're there. With just one syringe, I am able to fill both the top and bottom trays three times. This is what my one week treatment consisted of; three evenings using PolaNight and three boosting treatments using PolaDay. I loved my teeth whitening experience. Although my teeth don't look shockingly whiter in the picture above, I am very happy with the results. As you can see, my teeth were relatively white to start with, however the whitening lifted some staining on my bottom teeth and made my teeth look brighter and healthier overall. Now, I could have continued whitening my teeth to show you just how powerful this treatment is; after all, I have two syringes of PolaDay and PolaNight left! However the more product you use, the whiter your teeth get and, quite frankly, there is such a thing as too white. The treatment cost £400.00, which is quite expensive, however the results are amazing and the procedure is pain-free and super simple. Knightsbridge Dental Care were amazing - they provided with me with all the information I could possibly need and were always available if I had further questions or worries. For me, custom-made whitening trays are the perfect way to whiten teeth - I would recommend it to anyone. The best thing about the treatment is that, once the gels have run out, you can buy some more...they are really affordable (I'm talking £23.00 for a pack of four syringes!). The most expensive part of the treatment is the custom-made whitening trays. So, as long as you look after your trays, you should be able to whiten your smile (affordably) for years!